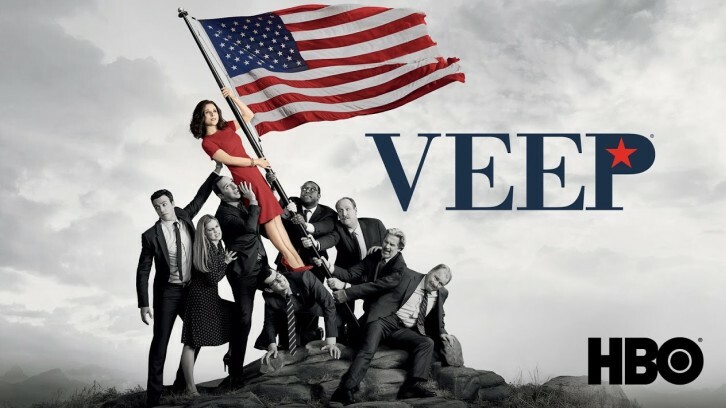 Veep is back for its seventh and sadly final season, and seems intent on going out on a high, cramming plenty of zingers into a premiere which reminds everyone what's going on, who's on who's side, and what the stakes are. They could never have been clearer, everybody is throwing their hat into the ring for an upcoming Presidential race. We open with Selina's campaign on a plane headed to Iowa to announce her intention to run for office, and at the airport, both Dan and Amy are waiting, trying to organise the crowd. Amy doesn't hold back with her insults as ever, telling a random background extra not to run off before anything has happened, arguing that this isn't a Terrence Malick movie and she can't just leave when she pleases. There's a lingering thread between both her and Dan this episode from last season that's not likely to be resolved anytimesoon over Amy's upcoming baby to be, and both are unwilling to address the elephant in the room with Amy unable to decide whether or not she wants to keep it. Amy thinks when Dan arrives in her hotel room that he finally wants to talk about it, but instead, it's only to let her know that he's about to sleep with someone else and she should keep the door closed. This was one of the more surprisingly emotional moments of the episode and I love that this show has provided Anna Chlumsky more to do this season beyond just her usual role of insulting everyone in the room, and Chlumsky really does a good job at adding depth to her character beyond what we've seen from her in the past. It's hard not to feel sorry for Amy. Selina's announcement for President is being shot in the foot repeatedly by a series of repeat occurrences that keep her changing the location for the meet. After her plan to announce the first time falls short she decides to return to where she launched her first campaign 9 years ago, but trouble is one the way as the organisation who she hired to set up the campaign the last time around were not paid, and are not willing to do so this time. Selina naturally views this as a stroke of good fortune when there's a nearby shooting, and like the horrible person she is, she suggests sending a thank you card to the shooter before learning that he shot himself in the process so he wouldn't have to face the consequences of his actions. Veep is a show about horrible people doing horrible things, and writer Lew Morton doesn't hold anything back in reminding just how horrible all of these people can be, eventually allowing Selina to have a fly-on-the wall announcement speech that she somehow manages to pull off with a little bit of dignity. The Meyer campaign are still intent on using Catherine and Marjorie's child as publicity purposes and Catherine - who broke down in tears when Selina announced for the White House, is not taking her mother's current campaign well. Selina, true to form, ignores her daughter once again and instead turns her attention to coming up with a reason as to why she wants to become President. Her real reason - that she thinks the American people owe her after years of not being able to do anything (she wants a war this time) is obviously not one that's going to poll well, but she rejects Marjorie's suggestion before she can finish speaking. Amy's suggestion of nuking all Americans is not much better, leaving Selina with little options. There's a new campaign organiser, Keith Quinn - in tow for the Meyer campaign and the gang is worried as on his last campaign, he fired the former campaign staff. Selina predictably dismisses Keith - right from the start, organising real meetings in backroom offices whilst distracting Keith and letting previously fired Ben Cafferty run things. Despite asking for a booklet about what went wrong on the old campaign and how things could be improved this time around Selina shuts Amy's near-500 page book almost immediately, hilariously insulting the person who put down a suggestion that there was too much of a blame culture going around and shuts the book when told she's unwilling to listen to criticism. As ever, Julia Louis-Dreyfus is on unbeatable form here, and already, just one episode in, absolutely deserves that Emmy that's got her name written all over it. It's Veep's final season, and based on the strength of this stunning first episode, this seven-episode season is set to go out on a very high note indeed. The show is back like it never left, with all the cast seamlessly fitting back into their roles. Every actor is on fire and the ensemble is at their best when they're all in the same room hurling creative insults at each other, and the series has plenty to spare in this episode. Some shows that start as vicious don't have as sharp a bite going forward but Iowa reaffirms that this show can be as incredibly brutal as it was at the start of season one, and I haven't even gotten to the Jonah campaign yet, which Richard somehow has managed to find himself working for as well as the Meyer campaign. More of Sam Richardson is always a good thing, and hearing his comment about wanting both campaigns to win because he likes both people too much to pick a side raises an interesting question - would America survive a joint Jonah/Selina presidency? Jonah, who has been everybody's favourite easy target for bullying over the course of the past six seasons has branched out on his own and is running for office with his own awkward campaign made up of guest stars that include the likes of the always-brilliant Patton Oswalt. Both his character Teddy Sykes and Bill Ericsson are shocked to learn of the nature of the relationship with Jonah's wife, and the fact that she was once his step-sister. It's embarrassing enough to almost make Bill wish he was back in prison, and serves as a reminder that Jonah's staff are as incompetent as Selina's. Nobody comes out of this episode looking good (although after this announcement is made public, Jonah surprisingly goes up in the polls with straight white men, the demographic that Selina is targeting on Facebook), except for maybe Hugh Laurie's Tom James, who announces his intention to run in a much more dignified manner as the end credits roll. Even Selina admits that Tom's good, and now we later find out her former campaign manager, Keith Quinn, is now working for him. That's the Keith Quinn she wants, exclaims Selina.